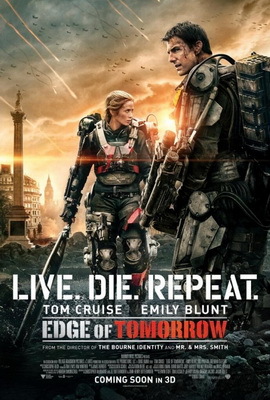 The “Edge of Tomorrow” is here and you should see it today at the movies. Wait a minute – how many times have I said that? Major Cage (Tom Cruise from “Oblivion”) is not a soldier, he’s a salesman. He has done such a good job selling the war against the alien invasion General Brigham (Brendan Gleeson from “The Raven“) wants him on the front lines for the major offensive to film the glory and celebrate the General’s success. I forgot to mention we are five years in fighting the Mimics, which arrived in a meteor storm. They appear as wicked mechanical spiders that always seem to be two steps ahead in every battle. I wish the aliens were more humanoid, like the kind Shatner always faced in Star Trek, but this is not a movie about aliens. Our reluctant hero lands on the beach, Normandy style, and gets killed in the first five minutes. At least he went out killing one of the special Mimics. But, he wakes up and it’s the beginning of the same day and he lives it all over again. If there were a groundhog in the movie I could probably explain it better. Cage learns he must connect with the notorious Angel of Verdun, Rita (Emily Blunt from “Looper”) to defeat the aliens and save the world. She’s twice the soldier he will ever be, and she has to turn him into a one-man, alien-killing machine. It reminded me of when my wife tried to teach me how to use the vacuum cleaner and I could never get the hang of it. Director Doug Liman (“Looper”) gives us a good mix of special effects and special moments between our characters. Cage and Rita spend hundreds of days together – the same day hundreds of times – but never have time for a relationship. Their human struggle came through the sci-fi apocalyptic madness, and in 3-D.
Cruise is at home in this alien-infested nightmare, though I am not legally permitted to say why. He is able to communicate with aliens and I think they follow him on Pinterest. This movie has all the elements of Joseph Campbell’s “Hero’s Journey.” There are lessons in this paradoxical parable, and it’s still a pretty cool movie. For that reason I must give it 4 stars out of 5, and if we’ve had this conversation before then you know what I mean.